Theo Decker has lived through what many people could never imagine living through and his life's course has thus become completely derailed, he goes, "off the map." He survives a terrorist attack, one which his mother does not survive; this event initiates a chain reaction of self mutilating behavior and numbness to the world around him. Theo suffers from severe post-traumatic stress disorder and unrelenting depression over his mother's death, going so far as to say, "...when losing her I lost sight of any landmark that might have led me someplace happier to some more populated or congenial life." Before his mother's untimely death his father had already abaondoned them without a trace and The Goldfinch becomes a book about survival, in all of its ugly and beautiful forms. Theo's life, and survival, become wrapped up in one of the most simple and beautiful objects in the world: a painting. 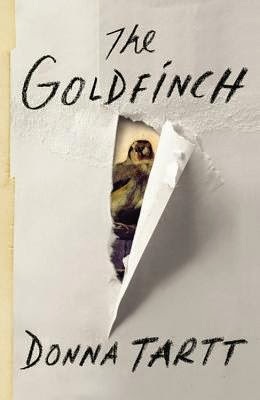 The Goldfinch not only tells of Theo's survival, but of his disquieted heart finding answers to life's most difficult questions, in the only way he believes he can, by chasing and recapturing beauty. Through this he comes to believe that, "We can't escape who we are." I am very on the fence when it comes to this book. The philosophical underpinnings of the entire narrative are philosophies I do not agree with, because I believe in self-invention and individuals choosing to take actions towards becoming the person he/she desires to become; a person's ability to choose amelioration or stagnation. Although, I can also appreciate how Theo comes to the conclusions about fate because of the experiences he has. I found echoes of Dostoyevsky in the most poignant parts of the novel. Both Crime and Punishment & The Idiot shined through Theo's experiences with obsession and its effects on his life. I love Dostoyevsky and enjoyed these parts, but I also found it at times unnecessarily laborious, the length and density of this work were often superfluous. When the story did become very slow and seemingly endless, however, suddenly an incredibly surprising and face-slapping event would take place and turn the narrative in a direction I never would have expected. I was also surprised to read somewhat obnoxious descriptions, such as, "... guys who looked like illegal immigrants." What do illegal immigrants look like, exactly? There were also a couple of times when the word "gay" was used as a derogatory term and I didn't think those instances were necessary for plot or character development. Lastly, I am pulled in the direction of awe and wonderment at quotes such as, "These things are deep -- they cannot be honored in words. Human tongue cannot express. But in the end -- putting him to bed with the shovel -- I spoke to him with my soul." So, I honestly cannot make a decisive judgement whether or not I really like this novel. This is as "on the fence" as I could ever get. I do not regret reading it, I understand why it recently won the 2014 Pulitzer Prize in literature, and I also understand why someone would decide to not finish the book at all. The characters were incredibly detailed and tangible, Tartt created an interestingly reliable and unreliable narrator when she formed Theo's presence in this novel. Consequently, there were many times when this book got me very worked up, Tartt was able to make me feel the exact things that Theo was feeling on more than one occasion. Therefore, I often felt sick or hungover. Theo experiments with many addictive substances, things that effect his physical state. So, in order to solve the inevitable heartburn and inflammation from reading this difficult and detailed work I would recommend buying a large box of Alka-Seltzer and administer it liberally. The effervescence will bring a welcomed relief to the new and oddly real sensations that come with reading The Goldfinch.